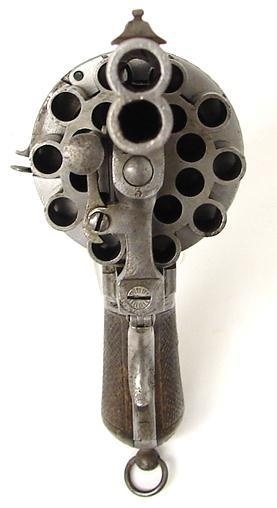 (1) An eight shot snaphaunce revolving pistol, Probably Germanic, but just could be English, I suppose. I'd need a good look at that inlay to be sure. Made circa 1600 to 1610. A lovely gun. Very desirable, and very valuable. (3)High quality English brass barrelled blunderbuss pistol. Can't see the maker's name. A London maker I should think, circa 1810-20. Safety catch to lockplate. 'Rainproof pan' will repay careful examination. Wheel on the frizzen spring to lessen friction. Spring bayonet to top of barrel. This is the humanitarian part of the pistol. Probably a pair of them used on a coach. If you have discharged the barrel at a highwayman, only winged him, and he is still kicking at the roadside, you release the bayonet then prod the highwayman with it until he stops kicking (very humane. The pair are very high quality, and again very valuable. Who is the maker please? The name on the lock-plate appears to be either A W Lenon or Lexon, the maker was given as Alexander Wilson (presumably the Alexander Wilson (Gun-maker 1805-1829) with addresses at Titchborne Street, Golden Square & Wilson's Gun & Pistol Warehouse, Sherrard Street, Piccadilly). P.s. when I said that the pair of blunderbuss pistols were for use on a coach, I did not mean a public stage coach, but a gentleman's private carriage. (4) A very good quality 'over and under' double barrelled wheel lock pistol. Probably French, and early, i.e. probably circa 1560 to 1580. Lovely inlay to stock. Yes, made for Emperor Charles V (French: Charles Quint; German: Karl V.) (24 February 1500 – 21 September 1558), also known as Charles I of Spain (Spanish: Carlos I), was Duke of Burgundy and ruler of the Netherlands from 1506, ruler of the Spanish Empire from 1516 and Holy Roman Emperor from 1519, until he voluntarily stepped down from these and other positions by a series of abdications between 1554 and 1556. Through inheritance, he brought together under his rule extensive territories in central, western, and southern Europe, and the Spanish colonies in the Americas and Asia. As a result, his domains spanned nearly four million square kilometers, and were the first to be described as "the empire on which the sun never sets". (6) Very fine quality three barrelled 'tap action' boxlock flintlock pistol by Durs Egg of number 132 The Strand London, who became gunmaker to King George IV and the Duke of York. Durs Egg was born in 1748 in Switzerland, an died in 1831. 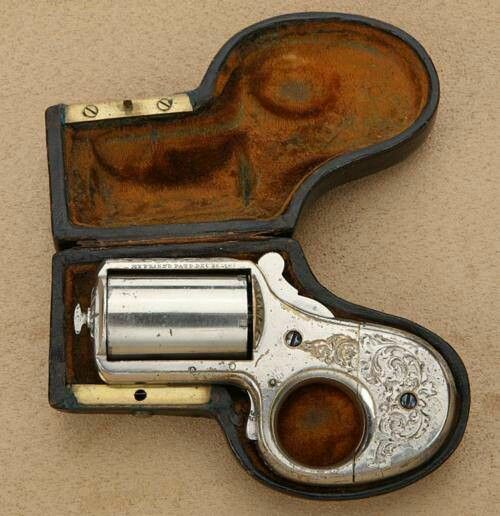 I would be interested to know for whom this magnificent little pistol was made? 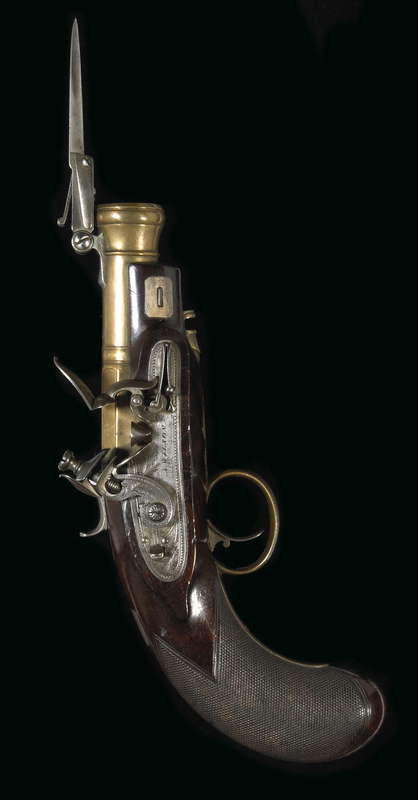 The picture purported to be of Napoleon Bonaparte's pistol, Mike. No other details were supplied. I take it the tap on the side-plate opened the touch-holes to lower barrels after the first had been discharged and the pan re-primed? No, no repriming was necessary. The pistol had be recocked after the first shot was fired, the tap turned through 120 degrees and the trigger pulled. This process was repeated for the third shot. I've not used a triple tap action, but have used and examined a good number of over and under tap action pistols, and a 'flash over' between barrels is very rare. Ah, I think I see; so rather than 3 simple drilled touch-holes through the tap as I suspected, each of the three touch-holes had a hollowed out pan opening into it, allowing priming of all three by turning the tap when loading? Sorry, I missed an obvious bit out when telling how to fire the second and third barrels. It was - after recocking, and before turning the tap, the pan had to be closed by pulling back the frizzen. Yes, that would have been clear to an experienced user of flintlocks, except perhaps for the sequence. 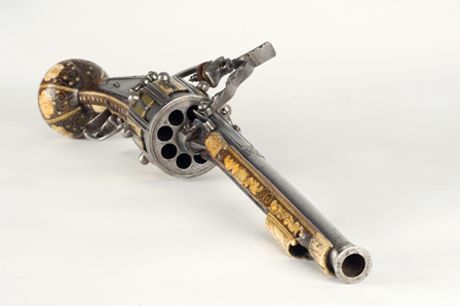 2. a 20 shot twin barreled revolver firing single shots from alternate chamber galleries. The chamber was mechanically revolved half the pitch between bullets after each firing to align the next bullet in the other gallery with the barrel. 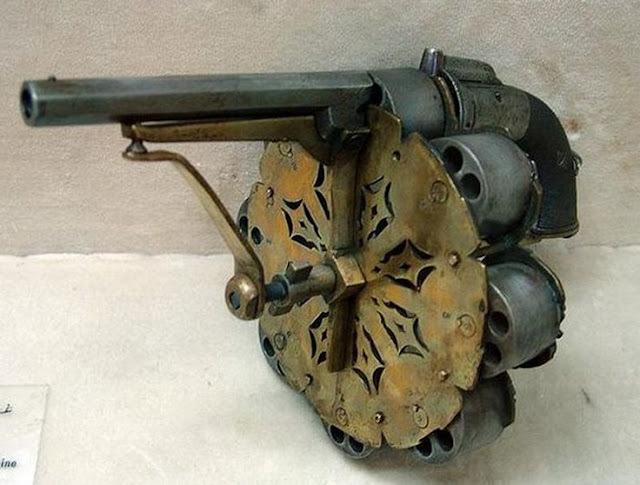 5. a 48 shot (8 chambers of 6 bullets) revolving-revolver; each chamber was exhausted before the next chamber was revolved into line with the barrel and firing mechanism. 7. a cased small-bore lady's palm-pistol, discrete and persuasive. 8. a 1905 speed indicator by L B Holmes to show the r.p.m. of shafts in industrial mechanisms, the pointed end was pressed into a conical depression in the shaft's end and a reading was taken. With reference to number seven; it was as you say, a persuasive weapon, the more especially as it doubled up pretty well as a knuckle duster. Of all the items you have shown here, the one I would most like to own (or at least to examine closely) would be number one here. I take it that it is now in a museum or a Royal (Noble) collection? Do you know where? Thank you. I must look up Maihaugen, and see if we can fit it in conveniently. Found it on Google. It's in Norway - large open air museum. It has an incredible collection of weaponry. 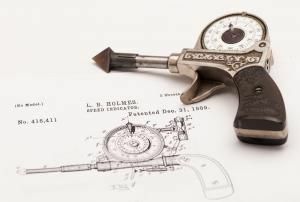 Already found an illustration of an ENGLISH wheel lock pistol, I'd no idea of its existence! Next time we're in Norway I think we must make a detour and see the place.